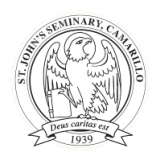 St. John’s Seminary complies with federal and state laws regarding the possession, sale and consumption of alcohol and illegal drugs. 1. Possession, use or distribution of illegal drugs is grounds for dismissal. Drinking is not permitted in the dormitories or other sites on campus except provided above. 3. It is a seminarian’s social and civic duty to abide by the laws of the State of California with regard to use of alcoholic beverages or driving under the influence of alcohol. Under no circumstances are seminarians to provide alcoholic beverages to minors. Violations of the criminal legal codes in these regards will result in disciplinary action. 4. In all circumstances, seminarians are to use alcoholic beverages responsibly. Fraternal correction is called for should a seminarian observe misuse of alcohol by another seminarian. Should misuse of alcohol occur, the seminarian observing this should bring the matter to the attention of the Director of Students. 5. It is expected that interaction with faculty will remain socially appropriate and educationally focused. A pattern of drinking alcohol between faculty and students is discouraged. 6. Prescription drugs are to be used only in accord with the directives of a physician and only by the person for whom the prescription was issued. Violation of these standards of conduct in regard to alcohol abuse will result in progressive discipline, depending on the gravity of the offense, up to and including disciplinary action and referral for prosecution. Any violation regarding illegal drugs constitutes grounds for immediate dismissal. The Director of Students documents records of such violations. California State law authorizes severe criminal sanctions for persons who provide or furnish any alcoholic beverage to a person under 21 years of age (Alcoholic Beverage Control Act: Sections 25658, 25660.5, 25662, and 25665). Violation of the Alcohol and Drug Policy by a recipient institution of Federal Financial Aid monies may place at risk the eligibility for St. John’s Seminary to secure federal financial aid for any of its students (Drug Free Schools and Communities Act Amendments of 1989, Public Law 101-226). That is, the irresponsible actions may threaten the financial eligibility of the entire seminary community. Both drugs and alcohol may be damaging to the development of an unborn fetus. Physical and psychological addiction to these substances is clearly a risk. source of assistance, and not an exhaustive listing.